Buzz Lightyear as a Kingdom Hearts character? Could happen. Longtime Kingdom Hearts veteran and co-director of the upcoming Kingdom Hearts 3D: Dream Drop Distance Tai Yasue told me at E3 this week that he'd love to take Sora and Riku through the wonderful worlds of Pixar's films. As a collaborative project between Square Enix and Pixar parent company Disney, Kingdom Hearts could definitely find its way into a setting like Wall-E or Cars. "Personally—and this isn't an announcement—I would really love to do a Pixar world," Yasue told me. "A lot of us do." "Any particular favorite Pixar world?" I asked. His answer: Toy Story. 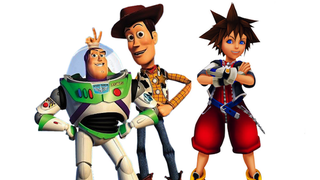 So maybe we'll get to see Sora and Riku fighting alongside Woody and Buzz in Kingdom Hearts III, whenever that comes out. If it ever comes out.